A clear majority of Ukrainians agree that their country should remain a single, unified state, according to a pair of new surveys conducted by the Pew Research Center in Ukraine and Russia – after Crimea’s annexation by Russia, but prior to recent violence in Odessa and other cities. The survey in Ukraine also finds a clearly negative reaction to the role Russia is playing in the country. 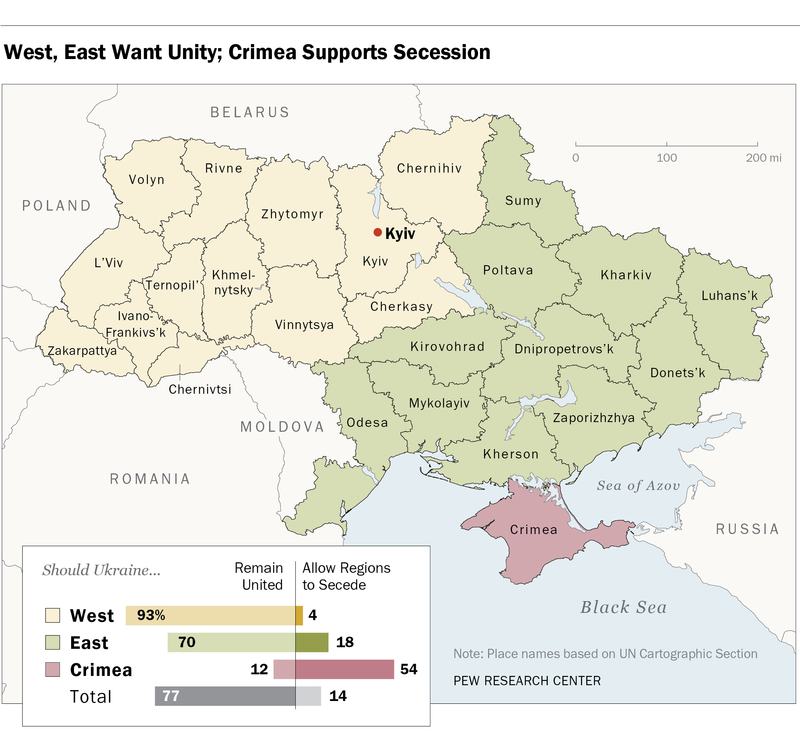 By contrast, the poll in Russia reveals a public that firmly backs Vladimir Putin and Crimea’s secession from Ukraine. Among Ukrainians, 77% say Ukraine should remain united, compared with 14% who think regions should be permitted to secede if they so desire. In Ukraine’s west, which includes the central region around Kyiv (Kiev), as well as portions of the country that border Poland, Slovakia and Hungary, more than nine-in-ten (93%) think their nation should remain unified. A smaller majority (70%) in the country’s east – which includes areas along the Black Sea and the border with Russia – also prefer unity. 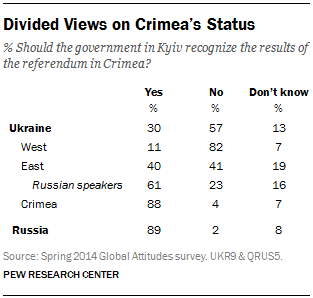 Only in the breakaway territory of Crimea do more than half (54%) voice support for the right to secede. The survey in Ukraine finds that ethnic Ukrainians and ethnic Russians largely have favorable views of one another. Nonetheless, there are stark regional divides, especially when it comes to the issues of official languages and governance. In western Ukraine, nearly two-thirds (66%) think only the Ukrainian language should have legal standing. By contrast, roughly seven-in-ten in eastern Ukraine (73%) say both Russian and Ukrainian should be official state languages. 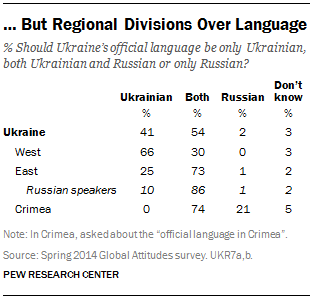 This view is especially widespread among the region’s Russian-only speakers1: 86% in this group think the Russian and Ukrainian languages should share official status. Meanwhile, in Crimea nearly three-quarters (74%) say both languages should have legal status on the Crimean peninsula. Lack of confidence in the central government is pronounced. Not including Crimea, fewer than half of Ukrainians (41%) say the current government in Kyiv is having a good influence on the way things are going in the country. Similar to views on official state languages, sharp regional divides are evident: six-in-ten in the country’s west rate Kyiv’s influence favorably, compared with only about a quarter in eastern Ukraine (24%) who share this assessment. Ukrainians are also divided in their hopes for the upcoming presidential elections. About six-in-ten in the country’s west (59%) expect the May 25th vote to be free and fair, compared with fewer than three-in-ten who share this view in eastern Ukraine (27%) and Crimea (20%). Whoever leads Ukraine next will face a steep challenge when it comes to repairing the public’s faith in the central government. Although half in western Ukraine say they trust Kyiv to guarantee personal freedoms, far fewer in eastern Ukraine (21%) and Crimea (7%) agree. Moreover, majorities in both the country’s east (71%) and west (55%) point to the nation’s lack of political leadership as a very big problem. 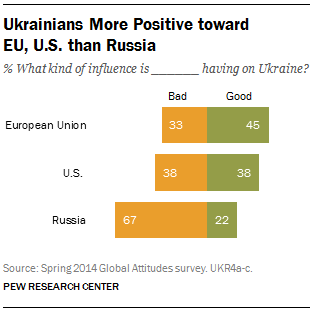 These are the principal findings from the latest survey in Ukraine by the Pew Research Center. Based on face-to-face interviews between April 5-23, with 1,659 randomly selected adults from across the country, the poll finds that along with questions about the country’s leadership, Ukrainians are far from satisfied with the involvement of foreign powers to date. The European Union fairs best in the eyes of Ukrainians, with a 45%-plurality describing its influence in Ukraine as good. Meanwhile, assessments of the U.S. impact on Ukraine are split: 38% positive, 38% negative. Russia is viewed with the greatest suspicion. Three times as many Ukrainians say Russia is having a bad influence on their country as say it is having a good impact (67% vs. 22%). At the same time, overall confidence in Putin’s handling of world affairs has plummeted from 56% in 2007 to 23% today. While overall attitudes toward Russia are not positive, a substantial minority of Russian-only speakers in eastern Ukraine are favorably inclined toward Russia. Roughly four-in-ten in this group (43%) express confidence in Vladimir Putin’s handling of international affairs, while 41% say that Russia is having a positive influence on the situation in Ukraine. By comparison, barely one-in-five Russian-only speakers in eastern Ukraine voices confidence in President Obama (19%) or thinks the U.S. is playing a positive role in their country (14%). Crimean residents are almost universally positive toward Russia. At least nine-in-ten have confidence in Putin (93%) and say Russia is playing a positive role in Crimea (92%). Confidence in Obama is almost negligible at 4%, and just 2% think the U.S. is having a good influence on the way things are going on the Crimean peninsula. For their part, Crimeans seem content with their annexation by Russia. Overwhelming majorities say the March 16th referendum was free and fair (91%) and that the government in Kyiv ought to recognize the results of the vote (88%). In Russia proper, the public also sees the matter as closed. More than eight-in-ten Russians (84%) think the March 16th referendum was fair and even more (89%) say Kyiv ought to validate the results, according to a new Pew Research survey in Russia, conducted among 1,000 randomly selected adults between April 4-20. The same survey finds that majorities of Russians (61%) agree that there are parts of neighboring countries that belong to Russia, and that the collapse of the Soviet Union was a great tragedy (55%). While the poll did not explicitly ask Russians whether they supported the Kremlin taking military action to protect ethnic Russians in Ukraine, nearly two-thirds (65%) agree that military action is sometimes necessary to maintain order in the world. Putin appears to have scored a political victory at home with his handling of the Ukraine crisis. More than eight-in-ten Russians (83%) express confidence in Putin to handle world affairs. At the same time, 92% have a favorable view of their country, including 51% who express a very favorable opinion of their homeland – up 22 percentage points from last year. When it comes to Russia’s image abroad, a 43%-plurality of Russians think Putin’s response to the situation in Ukraine has made people in other countries more favorably inclined toward Russia; just 26% think it has had the opposite effect.